Nov 25, 2018 John 18:33-37 What is Truth? Nov 18, 2018 Mark 13:1-8 When Will It Happen? Oct 28, 2018 Mark 10:46-52 What Do You Want? Oct 14, 2018 Mark 10_`7-31 In God We Trust? Oct 7, 2018 Mark 10:2-16 What About Family Life? Sept 16, 2018 Mark 8:27-38 What's in Your Wallet? Nov 26, 2017 Matt 25:31-46 Right or Left? Nov 12, 2017 Matt 25:1-13 Are You Ready? Oct 8, 2017 Matt 21:33-46 Pay The Rent! Aug 27, 2017 Matt 16:13-20 Who Is He? Aug 6, 2017 Matt 14:13-21 YOU Help Them! Easter Matt 28:1-10 He Lives! Dec 25, 2016 Luke 2:1-20 Christ Is Born! Nov 20, 2016 Luke 23:33-43 The Deed Was Done! Sept 18, 2016 Luke 16:1-13 Who is Your Master? July 10, 2016 Luke 10:25-37 Who is My Neighbor? June 19, 2016 Luke 8:26-39 What is Your Name? Apr 3, 2016 Psalm 150 Halleluiah! Mar 6, 2016 Luke 15:1-3, 11b-32 Which Son Are You? Feb 28, 2016 Luke 13:1-9 Repent! Feb 21, 2016 Luke 9:28-36 Who Would You Choose? Feb 14, 2016 Luke 4:1-13 What Tempts You? Feb 7, 2016 Exodus 34:29-35 Does Your Face Shine? Apr 20, 2014 John 20:1-18 Have You Seen Him? Jan 5, 2014 Jer 31:7-14 Mourning to Joy! Feb 3, 2013 1 Cor 13:1-13 What Is Love? April 8, 2012 1 Cor 15:1-11 HE ROSE! April 1, 2012 Mark 11:1-11 Hosanna! Feb 12,2012 1 Cor 9:24-27 Run Your Race! 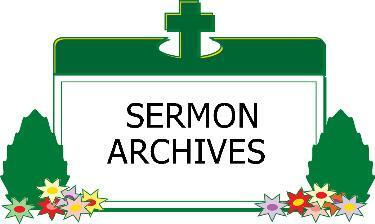 Feb 5, 2012 1 Cor 9:16-23 What's Your Ministry? Jan 22, 2012 1 Cor 7:29-31 How Shall We Live? Jan 8, 2012 Acts 19:1-7 Did You Get It? Nov 20, 2011 Matt 25:31-46 Sheep or Goat? Nov 13, 2011 Matt 25:14-30 Good Investors? Nov 6, 2011 Matt 25:1-13 Are You Ready? Sept 25, 2011 Matt 21:23-32 Do You Have Follow-Through? Aug 7, 2011 Matt 14:22-33 Why Do You Doubt? June 5, 2011 Acts 1:6-14 What to Do While We Wait? May 29, 2011 Acts 17:22-31 How Do I Witness? May 22, 2011 Acts 7:54-60 What Would You Do for Your Faith? May 8, 2011 Acts 2:14a, 36-41 What Should We Do? April 24, 2011 Matt 28:1-10 HE LIVES!! Dec 26, 2010 Psalm 148 PRAISE THE LORD!! Dec 19, 2010 Matthew 1:18-28 The Messiah Has Come!! Nov 14, 2010 Luke 21:5-19 Is the End Near? Sept 26, 2010 1 Timothy 6:6-19 So You Want to be Rich? Sept 19., 2010 Luke 16:1-13 Can You Be Trusted? July 18, 2010 Luke 10:38-42 Are You Worried? ©2006, Triple D Computers, Inc.